Enjoy a taste of the tropics at this custom-built home in Hatteras Village, just one lot back from the oceanfront in the upscale SummerPlace community. 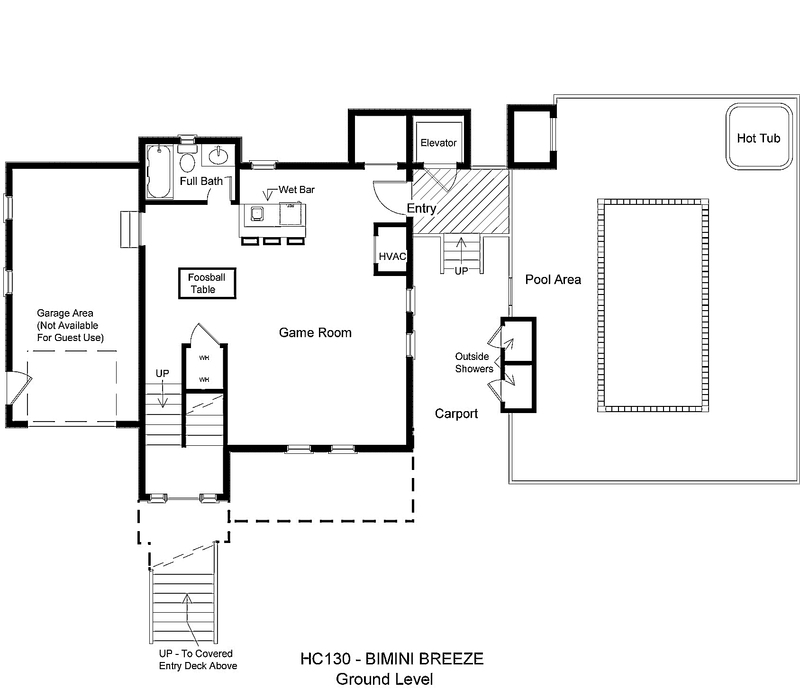 With an elevator to the covered decks on all levels, plenty of gathering space, and TVs in each of the spacious bedrooms, Bimini Breeze is the peaceful retreat you’ve been seeking. Unload your gear in the covered parking area and take a few steps up to the dry entry area, where elevator access will make move-in a breeze. Enter the home through the large game room with foosball table, the perfect hangout spot for kids and kids at heart. Kick back in the comfortable sitting area with TV or enjoy a cool beverage at the wet bar with minifridge. A full bath completes this level. Three ample-sized master bedrooms are on the middle level. 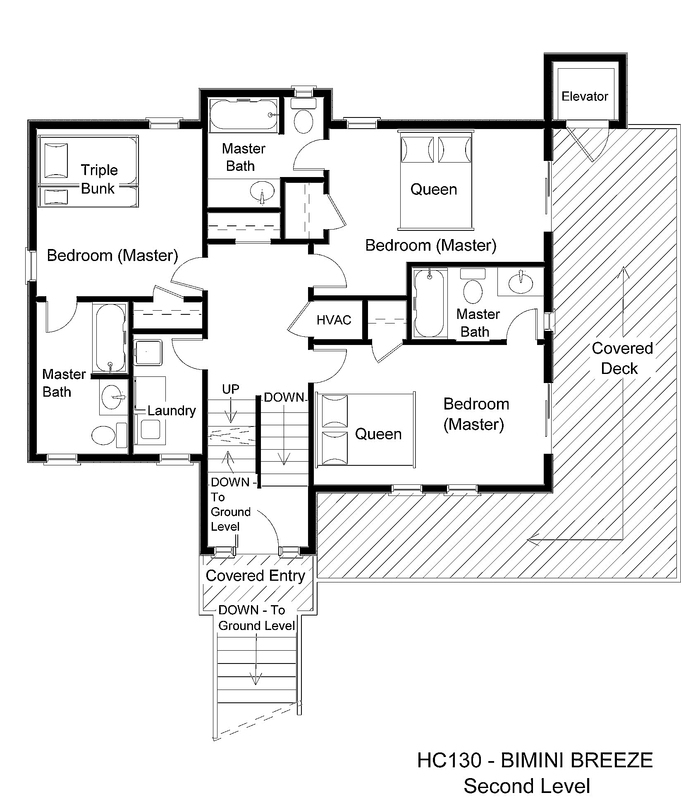 Two queen bedrooms open onto the shaded oceanview deck with elevator access. The kids will enjoy having their own space in the pyramid bunk bedroom. The laundry room, complete with utility sink, is also on this level. Relax before bedtime on the shaded deck while you listen to the ocean just on the other side of the dunes. Another large queen master bedroom on the upper level is the perfect place to rest your head after a busy day of vacation fun. Enjoy family feasts or movie nights in the open living, dining, and kitchen area with horizon ocean views throughout. Get toasty in front of the fireplace on cool winter evenings or watch the sunrise from the covered deck with elevator access. A half bath completes this level. Breathe in the sweet ocean air as you relax by the private pool or lounge in the bubbly hot tub. When you’re ready to hit the beach, the nearby community boardwalk over the dune will make your trip a breeze. Spend your days soaking up the sun, splashing in the waves, or shell-seeking to your heart’s content. If you’re craving adventure, a short drive will take you to marinas for charter fishing, the ferry to Ocracoke for exciting day trips, and countless other activities to keep the whole family entertained. Shopping and dining are an easy bike or golf cart ride away, as well as public sound access a short drive away just outside of Hatteras Village. 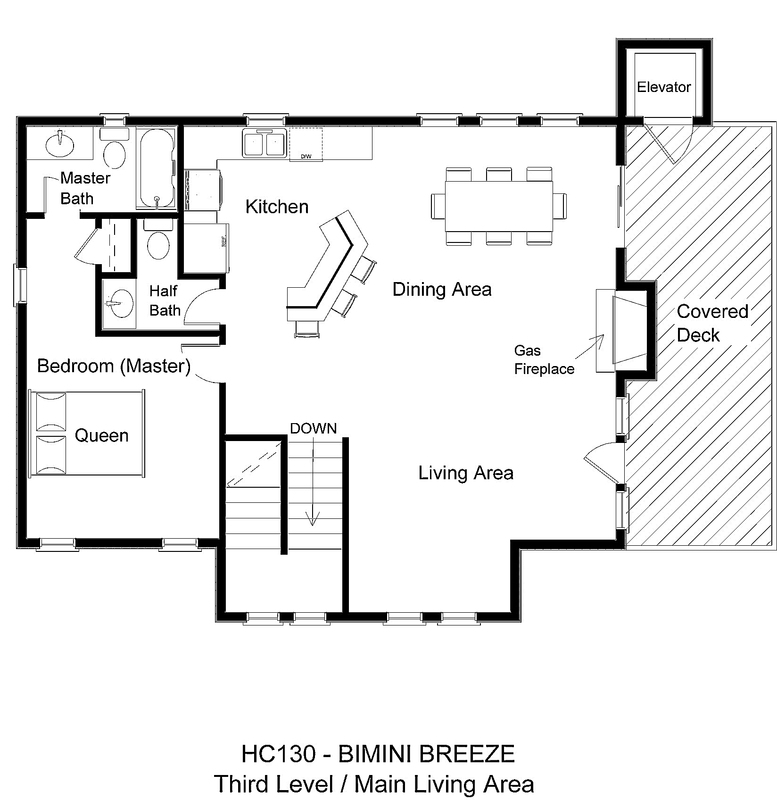 No matter what Hatteras Island vacation experience you’re looking for, you’ll find it at Bimini Breeze. Note: Garage area is owner storage and is not available for guest use. The loyalty discount is an amount determined by the owner. Great house and the pool is the best I have ever had in Hatteras.